Newark, like many other progressive American cities, has kept pace with the great development and commercial advancement which are characteristic of the age, and in many respects has outrun those cities which were formerly its leaders in trade. Her business men are among the most enterprising, progressive and far-sighted in the country and in almost every line of trade have built up patronage which redounds to their credit. 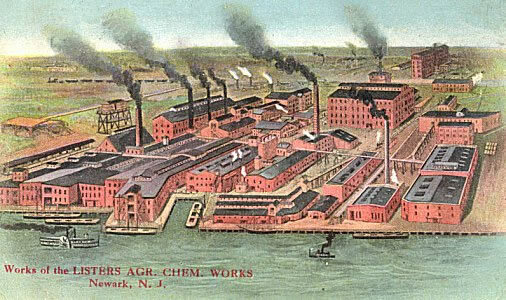 An establishment which has, through its products and its representatives, done as much as almost any enterprise in the city to spread the name and fame of Newark over a wide territory, is that of The Listers Agricultural Chemical Works. As long ago as 1850, this now extensive business had its rather modest beginning. It was founded by Alfred and Edwin Lister, and for many years traded under the name of Lister Brothers. Subsequently, about 1885, an incorporated company was formed, with a capitalization of $600,000.00, and the business title was changed to Listers Agricultural Chemical Works, under which name it has grown to its present magnitude. The company is engaged in the manufacture of bone fertilizers, bone black, glue, grease, etc., and it is no exaggeration to say these products are known and sold all over the civilized world. The company possessing long experience and thorough knowledge of the business, is placing upon the markets of this and other countries, a class of fertilizers which have been proven by actual tests and chemical analyses to be unsurpassed in general field results. This well-known fact has proved a valuable asset to the company in its business career, and it is not a matter of surprise that an increasing volume of business is yearly transacted. The company's plant on Lister Avenue covers eighteen acres, advantageously situate, and is equipped with the best machinery. Four hundred and fifty persons are employed. The officers of the company are President John F. Kehoe and Secretary-Treasurer Harry B. Carpenter.